You are here: Home > Blog > Energy, sustainability & economics > The million ponds project. Over the last fifty or so years, many of our freshwater ecosystems (rivers, streams and ponds) have been polluted – particularly with nitrates and phosphates. This pollution has lead to eutrophication : an overgrowth of simple green algae and subsequent loss of biodiversity. The million ponds project seeks to create new ponds, with clean, unpolluted water. 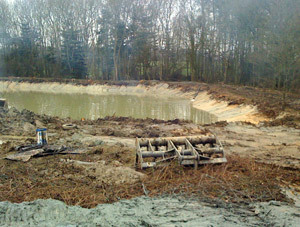 The question might be posed “why not clean up and manage existing ones?” Of course where this can be done, then it should be done but new ponds allow one to start with a clean slate. They can be created in places where their water supply will be clean throughout the pond’s lifetime, and generally creation is cheaper and simpler than the restoration of an existing pond. The million ponds project website offers a mass of information about pond building, specifically through the pond creation toolkit. The first step is to find a good place – specifically where the land use around the pond site is non-intensive, and where any water input is unpolluted i.e. not contaminated by fertilisers, herbicides or animal wastes. Inflows from streams often bring silt and nutrient rich water. Topsoil should not be added or be near the pond as again it will be rich in nutrients. 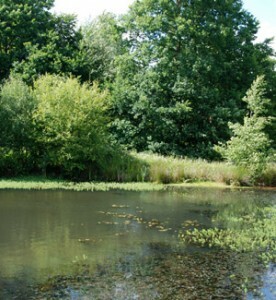 Woodland and low intensity grazed grassland are generally good places so that ponds have clean water. Another guiding principle to the creation of a pond “is don’t add anything” to quote from the million ponds website; not plants, fish, frogs, insects …. nothing. Let the pond colonise naturally (see factsheet 2 and factsheet 3). Designing pond complexes which offer a variety of different habitats (some deep, some shallow, creation of marginal areas, islands) is dealt with in another sheet, as is the construction and long term management of ponds. Advice on the creation of woodland ponds is given in a separate sheet, and on a smaller scale there is even advice on creating a pond for the garden. The Million Ponds Project is a collaboration of major landowners and land managers, co-ordinated by Pond Conservation - details here. One approach to pond building has been described in the blog, this year.